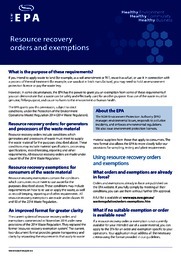 This page contains current resource recovery orders (orders) and resource recovery exemptions (exemptions) in force in NSW for commonly recovered and reused wastes. You can use an order and exemption without EPA approval but, all conditions of an order and exemption must be met for the reuse of the resource recovery waste to be lawful. You must also have, if necessary, development consent and permission from the owner and occupier of the place where the waste will be re-used. Where orders and exemptions can be used by anyone, the EPA publishes them in the NSW Government Gazette and on this page. Where orders and exemptions are granted to a named person, the EPA issues them in writing to the applicant only. The EPA has issued these orders to a named person so you cannot view them as they are confidential. Only the named person can supply their resource recovery waste. The exemption applies when you reuse their resource recovery waste. Please contact your supplier directly, if the resource recovery waste that you intend to re-use does not appear here. You can apply to the EPA for an order and exemption if there is no current order and exemption for your planned re-use of a waste. Our guidelines will help you to understand your responsibilities and obligations when using orders and exemptions. Read all sections of the relevant order and exemption carefully before supplying or re-using a resource recovery waste. If applicable, record all sampling and testing data so you can detect exceedances as soon as possible. E-mail the EPA at mailto:waste.exemptions@epa.nsw.gov.au within seven days of becoming aware that you have not complied with any requirement of an order or exemption. Keep the records required by an order or exemption for six years, including records held under the former Resource Recovery Exemption framework. For more information, e-mail waste.exemptions@epa.nsw.gov.au or contact Environment Line on 131 555.